Is there anything better than a brand new baby? Granted, there are plenty of people who would say yes, there are better things – some days, I’m one of them. But hey, I’m young yet, and am still enjoying this baby experience. Unfortunately, one of the constants of baby care is cleaning…all sorts of cleaning. At least in the beginning, that mostly means bathing. My son was born in December of 2005 and weighed in at 8lbs. 9 1/2 ozs. Thanks to him being born very, very fast (35 minutes) the doctors decided we had to sit in the hospital for a couple of days before going home. Since my schedule had been too hectic for a baby shower previous to baby’s birth, my friends and family converged on the hospital room bearing many gifts. Luckily these gifts included things like clothes and blankets; I’d only expected to be going in for my normal checkup and baby decided to be born instead. The gifts also included a nice little hooded towel. Why do you really want a hooded towel? 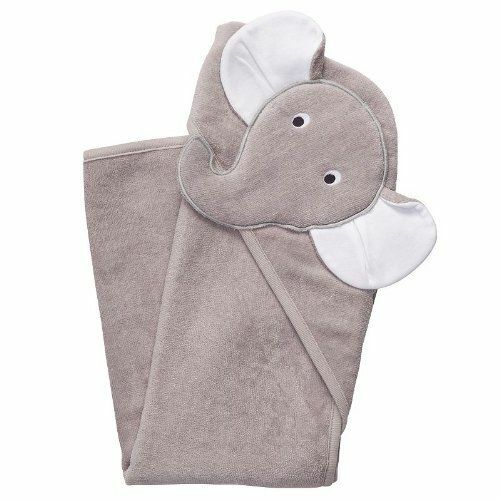 For those of you planning for a new baby and are unfamiliar with hooded towels, they are a very nice item to have. A hooded towel is a normal baby towel, but with an extra piece across one corner making a nice baby-head-sized pocket so you can be sure baby’s head stays covered at all times while drying after a bath. I forget what percentage of body heat the experts say you lose out of the top of a bare head, but it’s a lot. I live in a very old house that has poor insulation…and this was Wyoming. In December. I parked baby’s little bathtub in the living room right in front of the heater and it was still horribly drafty. A quick rummage through items from my impromptu baby shower yielded the perfect solution: This towel. The Carter’s Starters hooded towel is very soft and about the size of a standard receiving blanket. Expect something similar to normal terry towels, except that the terry “bumps,” for lack of a better word, are much smaller and made of looser fabric. The end product is a soft but not very absorbent towel. I suppose, considering the size of an average newborn baby, the lack of absorbency isn’t a very big issue if you can towel dry, then unwrap while still slightly damp to put fresh clothes on baby. In my drafty house, I couldn’t do that. I ended up using two towels each time, first wrapping and drying as much as possible, then re-wrapping him and then wrapping us both in a blanket on the couch until he was absolutely dry. Part of the extra moisture problem can be attributed to his full head of very thick hair, plus a healthy helping of the normal “monkey fuzz” all over his body for the first couple of weeks. I enjoyed the hood feature of this towel because, regardless of what I do in the process of drying my son, it stays on his head. I do wish the towel could have been a bit larger. This particular one only lasted me about a month before he was just too darn big to use it. All my friends and family like to joke about me having a super-size baby; by eight months old he wore a size 5 diaper and 18-month clothes. I don’t imagine the size of the towel is quite as big of a problem with more “standard-size” babies. To conclude, I can’t say anything about the durability of this towel since I barely got to use it before baby outgrew it, for the approximately thirty washings it presided over it performed nicely. Absorbency is pretty good for a baby towel, as stated I personally would have liked more but I was also a paranoid new mother in a drafty house in the middle of a Wyoming winter. The hooded design of the towel really is a plus and I definitely recommend all new mothers stock up on these. Disclaimer: I am in no way affiliated with Carter or any of its retailers, marketers, or other such people. The views expressed here are my own; I received no payment for the creation of this review, and have been given no incentive to shine a positive light on this product.